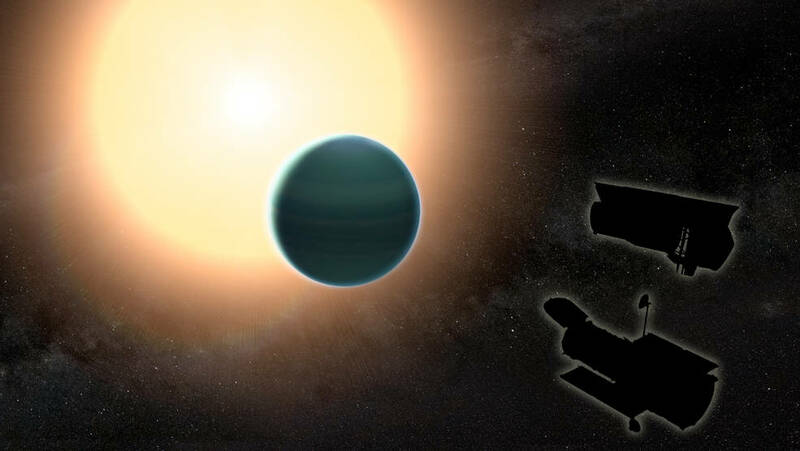 May 11, 2017 – A study combining observations from NASA’s Hubble and Spitzer space telescopes reveals that the distant planet HAT-P-26b has a primitive atmosphere composed almost entirely of hydrogen and helium. Located about 437 light years away, HAT-P-26b orbits a star roughly twice as old as the sun. The analysis is one of the most detailed studies to date of a “warm Neptune,” or a planet that is Neptune-sized and close to its star. The researchers determined that HAT-P-26b’s atmosphere is relatively clear of clouds and has a strong water signature, although the planet is not a water world. This is the best measurement of water to date on an exoplanet of this size. The discovery of an atmosphere with this composition on this exoplanet has implications for how scientists think about the birth and development of planetary systems. Compared to Neptune and Uranus, the planets in our solar system with about the same mass, HAT-P-26b likely formed either closer to its host star or later in the development of its planetary system, or both. To study HAT-P-26b’s atmosphere, the researchers used data from transits— occasions when the planet passed in front of its host star. During a transit, a fraction of the starlight gets filtered through the planet’s atmosphere, which absorbs some wavelengths of light but not others. By looking at how the signatures of the starlight change as a result of this filtering, researchers can work backward to figure out the chemical composition of the atmosphere. In this case, the team pooled data from four transits measured by Hubble and two seen by Spitzer. Together, those observations covered a wide range of wavelengths from yellow light through the near-infrared region. “To have so much information about a warm Neptune is still rare, so analyzing these data sets simultaneously is an achievement in and of itself,” said co-author Tiffany Kataria of NASA’s Jet Propulsion Laboratory in Pasadena, California. Because the study provided a precise measurement of water, the researchers were able to use the water signature to estimate HAT-P-26b’s metallicity. Astronomers calculate the metallicity, an indication of how rich the planet is in all elements heavier than hydrogen and helium, because it gives them clues about how a planet formed. To compare planets by their metallicities, scientists use the sun as a point of reference, almost like describing how much caffeine beverages have by comparing them to a cup of coffee. Jupiter has a metallicity about 2 to 5 times that of the sun. For Saturn, it’s about 10 times as much as the sun. These relatively low values mean that the two gas giants are made almost entirely of hydrogen and helium. The ice giants Neptune and Uranus are smaller than the gas giants but richer in the heavier elements, with metallicities of about 100 times that of the sun. So, for the four outer planets in our solar system, the trend is that the metallicities are lower for the bigger planets. Scientists think this happened because, as the solar system was taking shape, Neptune and Uranus formed in a region toward the outskirts of the enormous disk of dust, gas and debris that swirled around the immature sun. Summing up the complicated process of planetary formation in a nutshell: Neptune and Uranus would have been bombarded with a lot of icy debris that was rich in heavier elements. Jupiter and Saturn, which formed in a warmer part of the disk, would have encountered less of the icy debris. Two planets beyond our solar system also fit this trend. One is the Neptune-mass planet HAT-P-11b. The other is WASP-43b, a gas giant twice as massive as Jupiter. But Wakeford and her colleagues found that HAT-P-26b bucks the trend. They determined its metallicity is only about 4.8 times that of the sun, much closer to the value for Jupiter than for Neptune. The Hubble Space Telescope is a project of international cooperation between NASA and ESA (European Space Agency). NASA’s Goddard Space Flight Center in Greenbelt, Maryland, manages the telescope. The Space Telescope Science Institute (STScI) in Baltimore conducts Hubble science operations. STScI is operated for NASA by the Association of Universities for Research in Astronomy, Inc., in Washington. NASA’s Jet Propulsion Laboratory in Pasadena, California, manages the Spitzer Space Telescope for NASA’s Science Mission Directorate, Washington. Science operations are conducted at the Spitzer Science Center at Caltech in Pasadena. Spacecraft operations are based at Lockheed Martin Space Systems Company, Littleton, Colorado. Data are archived at the Infrared Science Archive housed at the Infrared Processing and Analysis Center at Caltech. Caltech manages JPL for NASA.